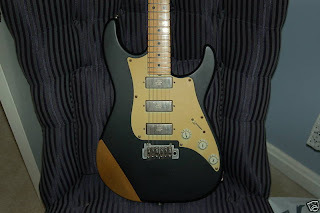 Here's a cool eBay find (220480641051) -- a Jim Tyler Studio Elite in BBQ Black, which according to the seller is a one-of-a-kind prototype matte finish and apparently, originally built for Mike Landau. 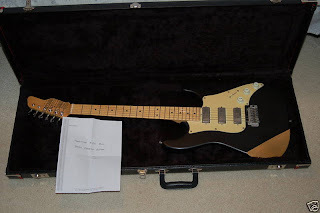 This guitar features a maple fingerboard on a maple neck , three Seymour Duncan mini-humbuckers, Wilkinson VS100 bridge and a Mamywo body. Tyler generally eschews the Fender-style 'skunk stripe' method of installing trussrods into a maple neck. Instead, he glues his maple fingerboards onto his maple necks, just as he would a rosewood 'board. 'Mamywo' is a Tyler concoction meaning 'Malaysian Mystery Wood' aka jelutong which is a very light and resonant hardwood, commonly used for building houses in Asia (back in the day). A VTT push/pull control on one of the tone pots enables the player to bring in the neck pickup into the mix, no matter if the selector switch is on the 3rd, 4th or 5th positions -- very similar to the mod I described here -- which is always great for wringing out a couple more tones out of any three-pickup guitar. Also included is a certificate of authenticity signed by Jim.